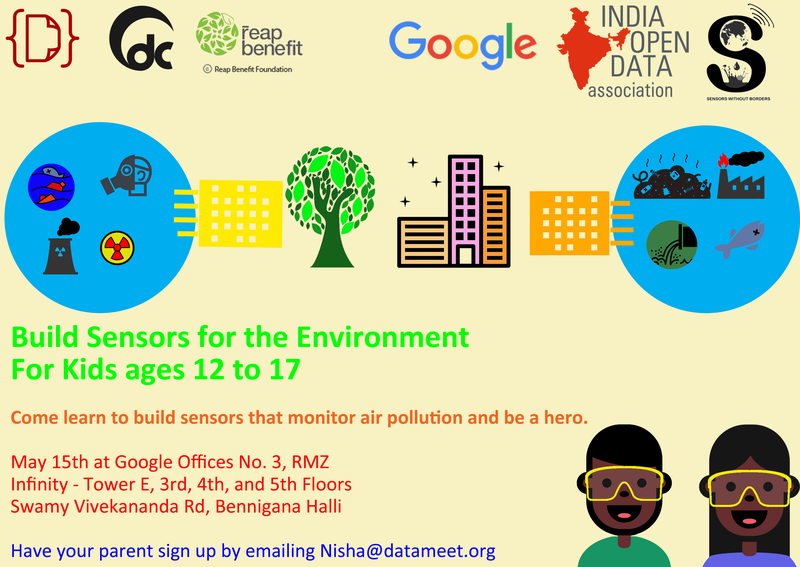 12 DAYS TIL 2016 Bangalore Open Data Camp: Pollution Party! DataMeet will be hosting the 5th Bangalore Open Data Camp: Pollution Party on May 14th and 15th. This year we want to spend time and look at the growing problem of pollution by spending two days examining the role of data. Last year saw a major turning point in the debate around pollution. Indian cities became a major focal point, as proof that New Delhi has worse air quality than reigning champion Beijing was proven with data. This put a spotlight on air pollution problem across India. At the same time water pollution from industry has also come up in the foaming lakes and rap videos fighting for recognition of pollution and its effects on people. The economic and development growth has meant that the building industry has been in over drive bringing sand and dust into urban and peri urban areas in large quantities plus the growing lack of proper trash disposal has had major health implications for people from all social economic backgrounds. However, the actual exposure of pathogens and pollution is not well known, extensive data has not been made available or is being collected in a way that can’t be easily understood or acted upon. This has spurred the rise of data collection networks and agencies to fill this gap. In every major city citizen supported cheap sensor devices have been put around cities to add data to the small number of official government monitoring stations. This year at Open Data Camp we want to explore the role of these data collection network in a growing citizen and private sector monitoring role. What is the role of open data? When these networks grow can there be agreement on standards and formats to be maintained? and Are there financially sustainable solutions that can be built on open data? Notably Karnataka State Pollution Control Board is attending to give the keynote in the morning and hopefully bring some data with them for us. 5) What you can do with robust data? Where is this happening? Venue? Any talks or demos on day 2, other than the workshop for kids?